I mean, i’m not one to talk about tattoos (I have a rocket ship tattooed to my arm) but this one is a ballsy as you can get. Either this guy ate paint chips as a kid or he traveled to the future and saw the this year’s Superbowl happen. Those are the only two causes of this particular piece of body art. Well, good luck to you sir. 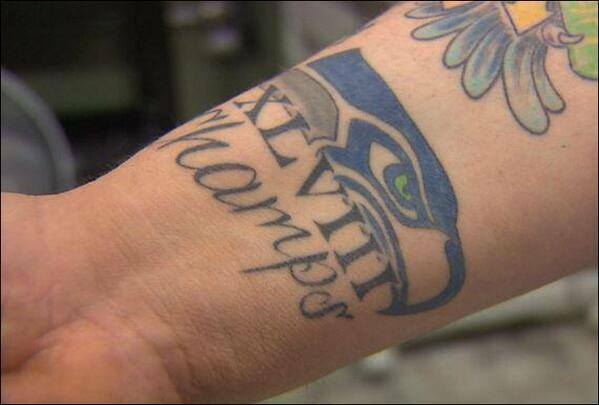 I will be rooting for the 9ers so you look like an idiot. Posted on January 16, 2014, in Average Blog Posts and tagged 49ers, 9ers, NFC, NFL, prediction, seahawks, superbowl, tatto, tattoo. Bookmark the permalink. 5 Comments. I know 52 guys in red and gold and a coach in khaki pants who disagree! I hope Harbough rips the pen off of his neck and colors over the tattoo after their victory. Can’t deny that is out of his wheelhouse.